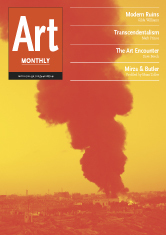 It Was What it Was: Modern Ruins– Gilda Williams discusses her feature in the May issue of Art Monthly pinpointing the difference between a building that has become a ruin and one that has become derelict. She uses examples of artists that have made works that hinge on this difference. She is joined by Maria Walsh who discusses the films of Hannah Sawtell developing ideas on Entropy and the digital.. This entry was posted in Art Monthly Monthly, Shows and tagged art monthly, cinnect, derelict buildings, film, florin tudor, gate cinema, gilda williams, hannah sawtell, iraq, iraq war, jeremy deller, le corbusier, maria walsh, mark beasley, matt hale, modern ruins, mona vatamanu, project unite, regeneration, ruins, teresa margoles, unite d'habitation, vacaresti, villa savoir, yves aupetitallot on May 19, 2010 by artmonthly.